avocado recipe collection. Avocados are green colored pear shaped fruits that have a leather like outside layer and a creamy flesh inside. The flesh resembles that of mango in texture but the taste is very buttery and blandish. Because of this, it can adapt to any new flavors very easily. Even though it is high in fats, these are healthy fats. It is highly used in Mexican cuisine as dips and is even added to a lot of smoothies. It is supposed to be one of the healthier fruits as it contains many vitamins and minerals. Avocados are a great source of energy, protein, vitamin E, fiber and omega 3, thus helping in proper digestive functioning. It is one of those fruits that should be included in our diet regularly. The benefits of avocados can be reaped in many forms. You can add chopped avocados to different dishes or puree it or mash it. There are so many salads where avocado can be added. There is a simple Avocado Salad with capsicums, tomatoes and baby corn, only flavored with lemon juice and honey or the innovative Avocado Grapefruit and Strawberry Salad, which has fruits instead of vegetables. It can also be had in a smoothie form with spinach, chia seeds and other super foods to make one Hydrating Energizing Smoothie. Due to its creamy, buttery texture, dips and dressings made with avocados turn out to be super smooth. Mexicans use avocados to make their world famous dip – Guacamole. Here avocado is mashed and seasoned with green onions, tomatoes, garlic and chilli powder and the flavors come together very well. This guacamole can then be used to make Guacamole Onion Rings, an innovative twist to the regular onion rings and in the 7 layer Mexican dip, perfect for parties and or just binging! These dips mentioned above can be served alongside some potato or nacho chips, making it perfect for entertaining people at your house. If not as a dip, you can chop it and place it on tiny bread pieces and make crotinis with it. On these, you can add different ingredients with avocados like Avocado and Coconut Crostini or Almond and Avocado Toast. Since avocados can easily adapt to new flavors, it becomes easy to use it for new and innovative recipes. With peppy spring onions, zesty lemon and salty cheese, Avocado and Feta Mash is the newest way to eat your breakfast as it has so many textures of crunch, soft and crumbly. Unknown to many, avocado and chocolate make a wonderful pairing. On whipping avocado gets a creamy mouse like airiness and that can be used to make an Avocado Chocolate Mousse. Something even more exotic than this is the Avocado Ice cream! It is soft creamy, smooth and flavored with condensed milk, which also gives it richness. 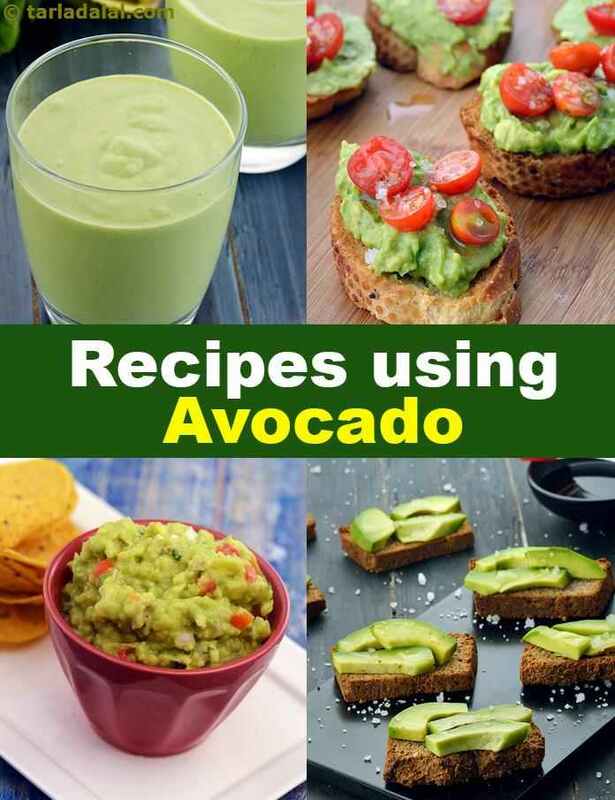 Enjoy our avocado recipes collection below.